A Dutch designer, Tjeerd Veenhoven has come up with a concept that may save all iPhone users some money on their electric bill. Instead of plugging in to constantly recharge Tjeerd has designed the iFan concept. It powers the iPhone by wind. 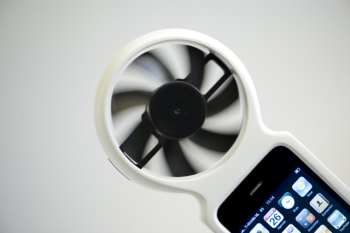 To charge the iPhone by wind, the IFan, a rubber skin with a fan on top, is placed around the iPhone. Tjeerd tested out his concept using a modified computer fan. He was able to charge his phone in 6 hours. It isn't very fast. In fact, it is quite a long time, but Tjeerd Veenhoven, knows this is slow and is working on modifying the design. He plans on redesigning the fan blades so that they work more efficiently. Most recently he worked on coming up with a solution to mount the iFan to a bike handle (possibly other vehicles) so that the iPhone can charge while cyclist ride his bike. Gigantic Water Play Slide: Take a Ride on this Slide!